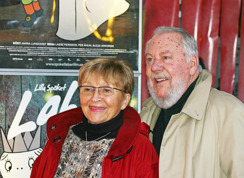 Inger and Lasse married in the spring of 1950 and moved to the Värmland countryside. This was long before the “Green Wave”. Lasse, having attended a year at Backmans Illustrationslinje, was already an established cartoonist and illustrator, something which he continued doing. In addition he was asked to do illustrations for stories published in the children’s pages of various newspapers and magazines. The collaboration with Inger started in 1950 when Lasse asked Inger to write stories for his illustrations. In the autumn of 1951 they moved to Strängnäs where Inger started her teacher training. In the spring of 1952 their first child Lena was born. Inger took study break but continued with them a year later. Lasse became a house husband, taking care of Lena during the day and drawing at night. Inger graduated in 1954 and became a certified primary school teacher. In the summer of 1955 Niklas was born and the family moved to Karlstad. Books: Inger and Lasse Sandberg’s first book Fåret Ullrik Får Medalj was published in 1953 by the small publishing house Eklunds. In 1959 the book Jonas, bilen, och äventyret was published. A compilation of stories, Godnattsagor På Rullgardinen, was released in 1960. Inger and Lasse were able to not only work with all of their ideas from the 50’s but also a wealth of new ones. This was the start of an enormous production. 30 Sandberg books of varying character were published during the 1960’s, 23 animated childrens’ programmes were produced and there were 2 theatre performances. In 1965 Lasse received the Elsa Beskow plaque for his illustrations in the picture book Lilla Spöket Laban. Inger searched book shops and libraries for books that she felt were needed but did not exist. This is the reason behind the conception of the first 5 Lilla Anna och Långa Farbrorn books. These interactive picture books, aimed at children aged 0-3, were published in 1962 as the Sandberg family were awaiting the arrival of their third child. At Christmas time 1962 a baby boy, Mathias, was born. In 1964 the first Lilla Anna book was released in the USA. A release in Sweden and throughout Europe followed a year later. 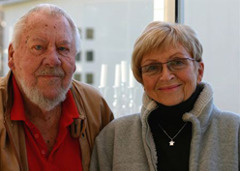 Inger and Lasse were making the types of picture books that had not existed before. In 1969 the environment themed book Filurstjärnan was published in cartoon format. Inger developed an interest for schools in London, in particular an “open plan” school which later featured in the picture book Lilla Anna i Glada skolan and in two programmes for Swedish Educational TV. The first of the Sandbergs’ three anti-smoking books came out in 1971 “Vad är det som ryker?”. Lasse had, in a playful manner, begun to introduce Collages in his illustrations and picture books during the 1950’s. 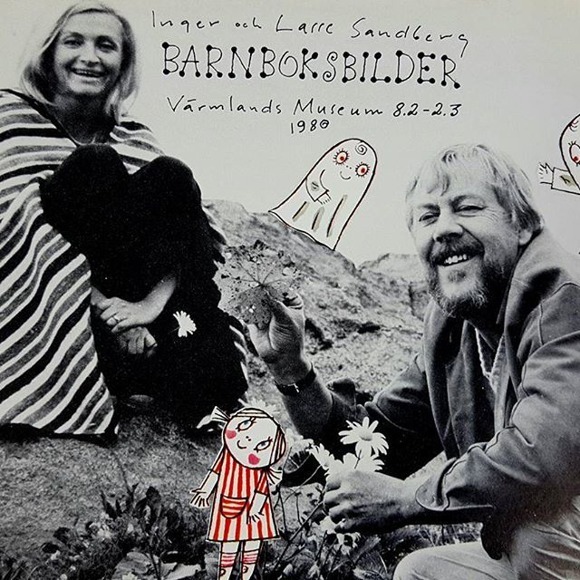 In the 60’s and 70’s Lasse’s collageart was developed into large, inspiring picturebooks. Lilla Anna and Spöket Laban reappeared demanding to be included in television programmes and the new books. In 1978 a new much loved character, Tummen, was born. Tummen and his mum appeared in several books and some 20 TV programmes. In 1978-79 Inger and Lasse travelled to Australia and New Zealand where they lectured and appeared on both radio and television programmes. They became very interested in the educational system of New Zealand. It was in the 1980’s that the grandchild Pulvret started to feature in a series of books alongside his grandparents. Gothenburgs symphoni orchestra composed music influenced by the book Vit och Svart och Alla De Andra. The books Lilla Nollan och Dom Andra and Sandbergs ABCD were also published in the 80’s. Inger’s free knitting was portrayed in the book Mina Glada Tröjor which was released in 1985. Inger and Lasse travelled to the USA and Venezuela on work related trips and to take part in exhibitions. In 1989 Lasse’s art book Bilder Från Klotet was published. In 1992 the ”keep safe” book Nej, Sa Lilla P was released. Inger and Lasse also created the first 4 books STOR och småböckerna in Swedish. These books were used in schools to help children learn to read, a system based on the one used in New Zealand. 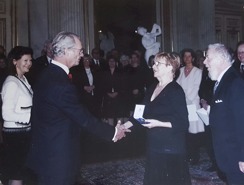 In 1995 Inger took a break from writing since her work as a ”visiting author” in Singapore, Taipei, Seoul, the USA, Australia, and New Zealand demanded a lot of time and energy. In 1996 Lasse wrote and illustrated a book featuring Hubertus Jansson called När Jag Var Mindre – En Bok För Större Barn. On 2 February 2002 Lasse Sandberg’s retrospective exhibition opened at Värmlands Museum. The exhibition went on until 1 April 2002. Inger started writing again and since 2003 four new books have been released; KONSTIGT, SA LILLA C, TUMMENS KALAS, VEM ÄR DET SOM LÅTER? SA SPÖKET LABAN och ÄR DET JUL NU IGEN? SA SPÖKET LABAN. The 8:th of November 2008 Lasse Sandberg left us and will be greatly missed. 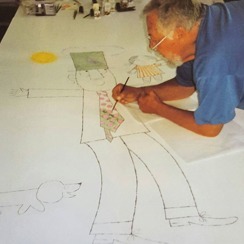 But until this day, Lasse is still considered one of Sweden’s biggest illustrators and children book author ever. 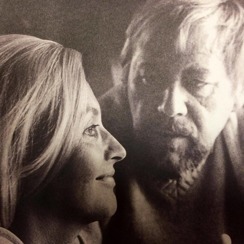 The beautiful authors, Lasse och Inger Sandberg. 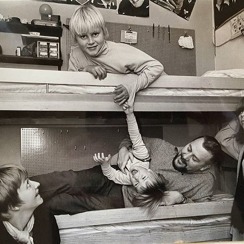 Inger and Lasse with of their beloved children. Lasse work with the Tall Uncle. Across the living room floor.